The ScratchX micro:bit extension lets you control your micro:bit wirelessly using Scratch programming blocks. You can use the tilt sensor or push buttons to design a whole new way of interacting with your Scratch projects. Use the LED matrix to display information or create light animations. NOTE: The extension only works with Mac OS X at this time. Install the Scratch Device Manager for Mac. Download the scratch-firmware-combined.hex and copy it to the micro:bit using the USB cable. Launch the micro:bit extension on ScratchX. 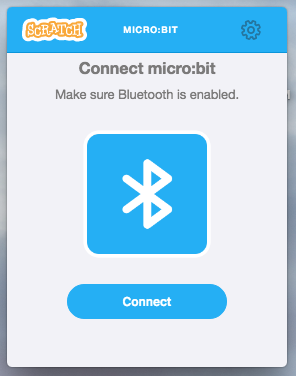 Click the "Connect" button in the Scratch Device Manager to connect to the micro:bit. 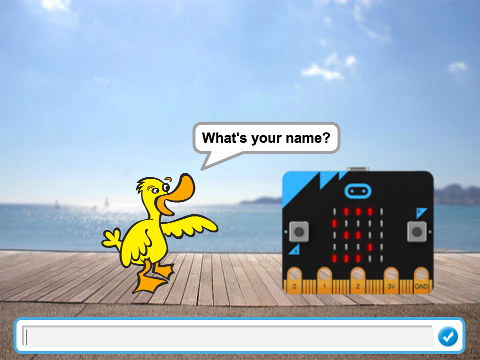 Move and animate the Scratch cat by pressing the A and B micro:bit buttons. This simple example displays text or numbers on the micro:bit LED matrix. 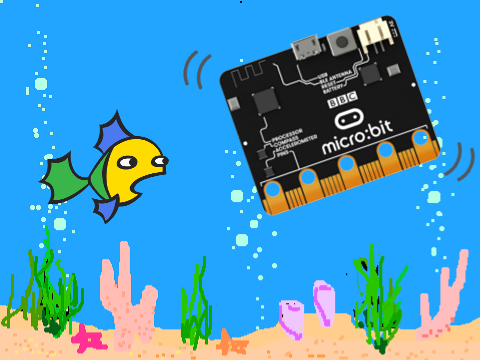 Move the fish around the screen using the micro:bit tilt sensor. Change the color effect of the fish by shaking the micro:bit. Do something when one (or any) of the buttons are pressed. Do something anytime the micro:bit detects movement. Do something when the micro:bit is physically shaken. Do something when the micro:bit is tossed in the air. HINT try putting the micro:bit in your pocket and jumping around. Display text or numbers on the LED matrix. If you display individual letters or numbers, they will remain on the display until something else is written. Words or multi-digit numbers will automatically scroll across the display. Display a symbol from the list on the micro:bit screen. Set an individual LED on or off. The LED Matrix is laid out in a grid with 5 rows (x) and 5 columns (y). Set all LEDs off (i.e. clear the display). Do something when the micro:bit is tilted in any direction.. Check if the micro:bit is tilted in a certain direction. Get the current tilt angle of the micro:bit in degrees. Do something when one of the pads (0, 1, 2) are connected to ground (GND).